The parents of twins dying from a rare genetic disorder which will kill them before they’re 12 are planning the family’s final holiday together. 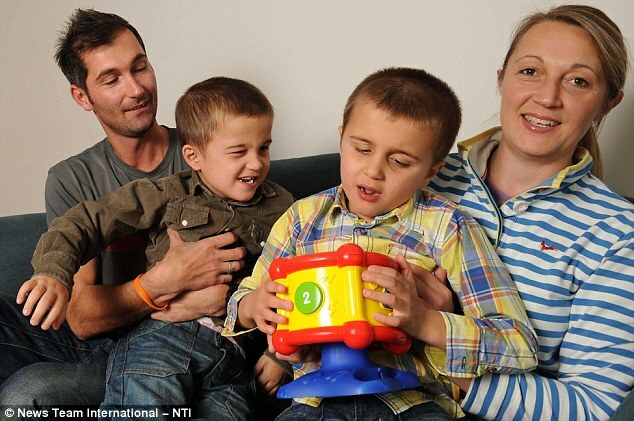 Seven-year-old brothers Freddie and Louie Dawkins were born apparently perfectly healthy but were diagnosed with deadly Batten’s disease when they were three. They are the only identical twins in the worldwith the neurological condition which affects just one in every 300,000 births. Mr Dawkins, 34, who quit his job as a furniture maker to care for his sons, said: ‘It is heartbreaking watching the boys deteriorate and knowing that there is nothing that can be done. ‘We are just making the most of each day that they are still here. ‘The boys both love swimming, so we take them to the pool four times a week. But what they really love is the sun. Even though they are blind they can tell it’s is bright when it’s sunny so they are much happier in summer. We went on holiday to Portugal thanks to the charity Starlight. ‘When Sarah and I got together we swam with dolphins in the Caribbean and we always said if we had children we’d do it with them. It’s our final wish to do that one thing for our boys. A spokeswoman for the Batten Disease Family Association said the charity was not aware of any other twins in the UK with the condition. Ms Finney, a nurse, said: ‘At first I thought that it was because the sun was in their eyes, or it was just that they were being clumsy. ‘But when their eyes started to flicker, I knew something was wrong. ‘They would try and pick up objects from the floor and completely miss them. It was as if they were struggling to see. ‘We were so shocked when we were told that they had lost their sight, as when they were born there had been nothing wrong with their vision. ‘I’d heard of Batten Disease, and I knew it was something terrible. When the doctors told us that they both had it, it was devastating. She said the twins’ frustration at the situation makes the situation even more heartbreaking. ‘It is very difficult and frustrating for them as they don’t understand why they can’t see any more, or read their favourite books. ‘It’s also hard because it’s like having toddlers who can reach anything, so we have to be with them constantly.